The used Rocrail revision must be at least 9832. This functionality is especially of interest for monitoring invisible spots on the layout, for example shadow stations. USB WebCams can be used and are low priced; High Definition WebCams are not needed for this purpose. For testing purpose a Logitech C170 has been used which comes for about €20,-. Rocview will not show the WebCam as a movie but as still pictures with a definable refresh interval which is OK to see what is happening. An external capturing program is needed to provide the still pictures to make this functionality for Rocrail Operating System independent; See the Script paragraph. The content of the text object must point to the WebCam picture. The Refresh time in ms must have a value of at least 100. A good value is 500. Resizing of the text object can be done with the cx and cy grid values on the General tab. 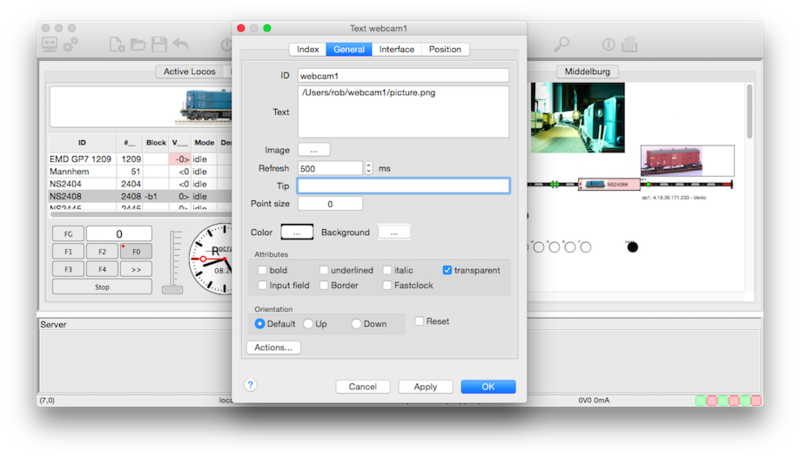 The tool WACAW is used on a Mac to capture a still picture of a WebCam. echo "Snapping a new picture of the webcam..."
There are 3 devices in the list. The current selection is 2. There are 1 inputs for this device (2). The current selection is 0. In this example the device number to use is 2: -d 2.
a list of video devices will be shown. If the PC/Laptop ha a build-in camera this will show up as /dev/video0. The first external WebCam will be in this case /dev/video1. This script has not been tested and uses Irfanview as capture tool. The folowing Batch script used commandcam.exe for grabbing and bmp2png.exe for picture converting and was successful tested. This files require less resources than IrfanView. Remark: The code above need that all files are placed in the same folder. Otherwise, the path information corresponding to the different directories have to be supplemented. If multiple video devices are installed, an additional option can select the device. Only one at a time of both programs, wacaw (or any other capturing program) and Rocview, should access the picture file to avoid invalid images. The script will capture a picture and store it in the picture.png file. Rocview will read and show it. The script detect that the picture.png is deleted and will capture the next picture of the WebCam.